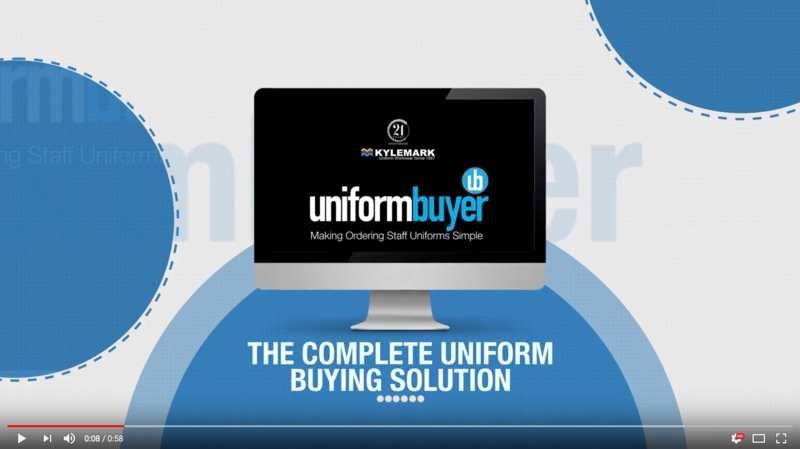 Kylemark aims to give you a smooth and easy uniform buying experience, whether it’s discovering a whole new company look or just updating an established style. As a large percentage of our clothing orders require personalisation by embroidery or print, we have invested in some of the most advanced machinery and IT systems to customise your garments quickly and accurately – every time. By retaining all finishing in-house we are able to keep control of quality, speed up delivery and reduce the end cost to you our customer, truly a win-win situation. 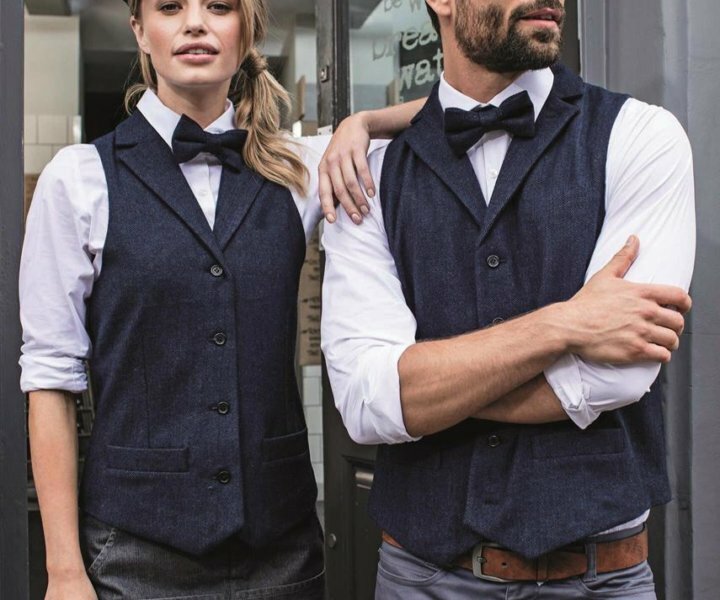 Kylemark’s Urban range of aprons, shirts, trousers and waistcoats have proved very popular and we’re happy to expand this in 2019. 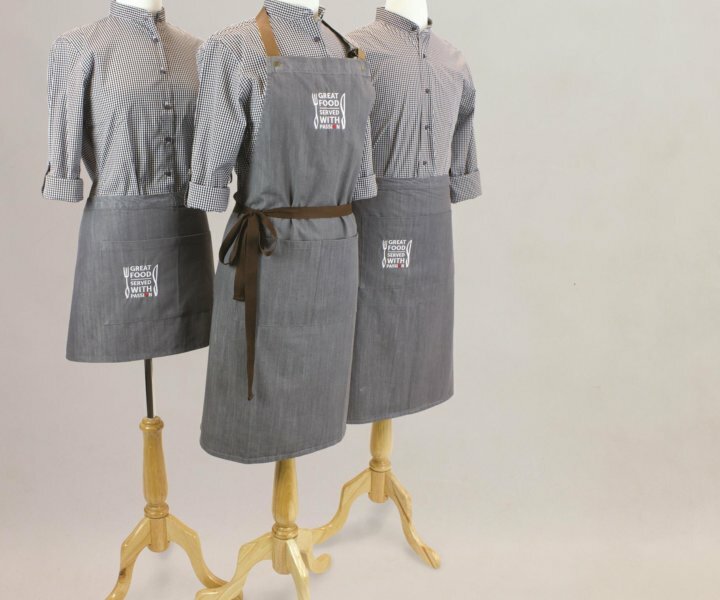 Combined with our well established Leather, Denim and Canvas Aprons we are sure you’ll find a style to suit your theme. Having worked with some of the biggest and prestigious names, the likes of Pitcher & Piano, Ted Baker, Brasserie Blanc, Restaurant Associates and Jim Beam, we are confident of handling anything that comes our way. We are here to make your life easier and with experience second to none you can be sure we’ll give you the best advice every time. Welcome to our latest issue of Uniform Buyer Magazine, our guide to the latest and best in corporate clothing for work. In this issue we have focused on Housing Associations and I’ve compiled some the newest and freshest styles available this season for your corporate uniform. Embroidery is the favoured way to brand your corporate clothing and workwear. There are many different methods to printing garments depending on volume and complexity of the design. Screen print, Digital print, Cad Cut and Heat Seal transfer. We have thousands of garments to choose from with ranges covering all sectors of business and organisations. View and buy online, phone in your order, visit our showroom or we can visit you at your convenience. Whichever way suits you best, you can be assured of the same excellent service and quality fulfilment every time. We’ve been in this business a long time now, if we don’t have what your looking for in our brochures or online catalogue, we will source or bespoke produce it. Just ask us, we are able to source from a vast list of contacts and suppliers, minimums may apply. If you are looking for a fresh innovative approach to clothing your staff or just want to compare service levels and value for money against your current supplier, our Five Star Plus Service may be for you. If you would like a meeting at your place of work to discuss your requirements then its about time you met Claire. Kylemark Corporatewear supply corporate clothing and workwear uniforms into many types of organisation big and small – whatever sector you operate within, we would be delighted to hear from you to discuss your uniform and service requirements. Hauliers, Builders, Engineering, Aerospace, Airports, Facilities Managers and Manufacturers. Hotels, Restaurants, Cafés, Caterers, Bars, Brewers and Distillers. Leisure Centres, Theme Parks, Holiday Parks, Visitor Attractions, Retail Stores, Golf Clubs, Racecourses, Museums, Travel Agents and Tour Operators. Spas, Beauticians, Health Clubs, Vets, Doctor’s Surgeries, Dental Practices, Nursing Homes and Care Companies. Client Days, Team Building Excursions, Point-Of-Sale Operators, Sports and Teams. Produced in our UK purpose built factory. We can embroider your logo or name onto your garments in our factory using our state of the art machines. We can print your logo or name onto your garments in our factory using our state of the art machines. Looking for something different? We can create bespoke uniforms from scratch to your own design. Didn’t Make it to Scot Hot This Year? Our market leading online service being offered to Kylemark Corporatewear customers with significant staff uniform requirement. 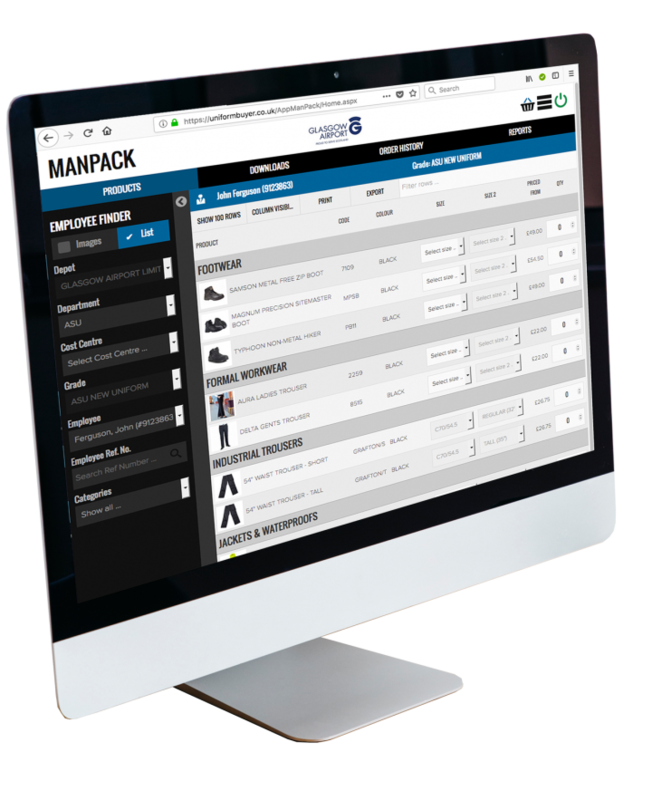 Fully customised to your business, your own profiled Uniform Buyer Portal, allows orders to be placed 24/7 from any location using a standard Internet browser. For customers with a regular requirement for uniform fulfilment we offer dedicated account management with one of our highly experienced team looking after every detail of your Workwear issues. Let us take your hand and guide you from identifying and choosing the right Workwear solution through to roll-out and continued service and advice on an ongoing basis. We have invested in the latest industry leading management system taking care of your order from enquiry through source, embroidery or print production, finishing to despatch – you can be assured of real time, real service management of your order. If you are placing a large uniform order or perhaps order on a regular basis, why have the hassle of sorting out who gets what and where? With our wearer packing service (minimums apply) each employee receives an individual pack of uniform named and labelled. Departments and locations can also be included. We can even deliver direct to individual employees’ place of work. Make your life easier. 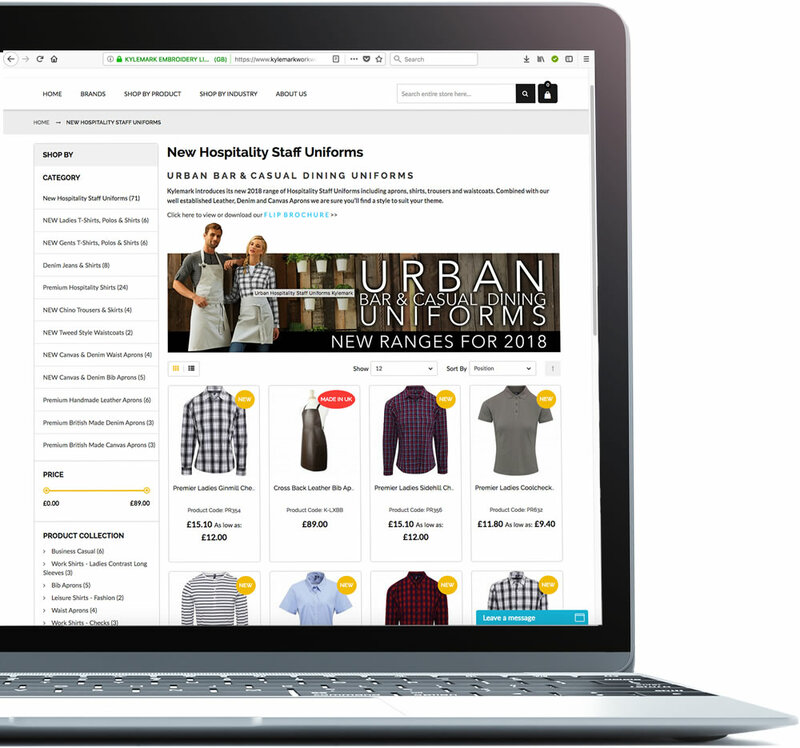 Search through our full catalogue of staff uniforms and workwear, buy online and add your embroidery or logo if required. Visit Our E-commerce Shop. 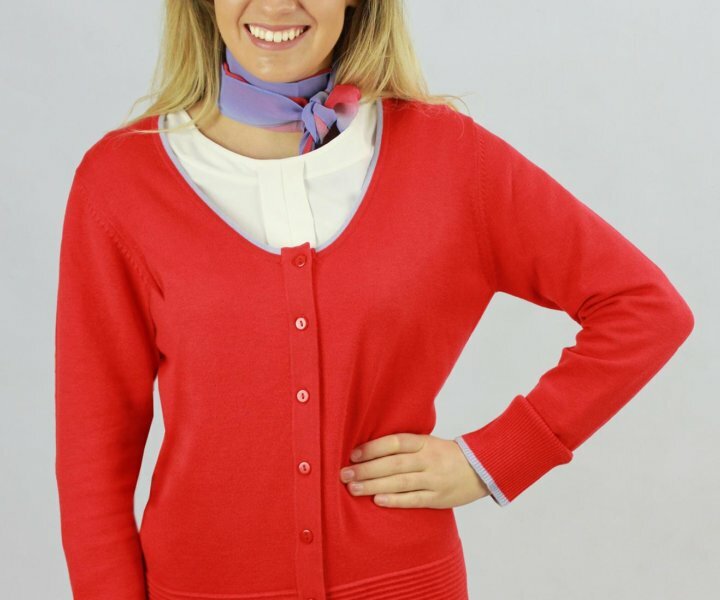 We have a huge selection of staff uniforms and workwear garments online. From Shirts to Safety Shoes, Aprons to Polo Shirts, if you can’t find what your looking for please contact us. Visit Our E-commerce Shop. You can personalise any of our items with your company logo or text. Choose from plain, embroidered, printed or heat seal branding options. Visit Our E-commerce Shop. We have lots of special offers and multi deals available, great when your buying multiple items. Visit Our E-commerce Shop.